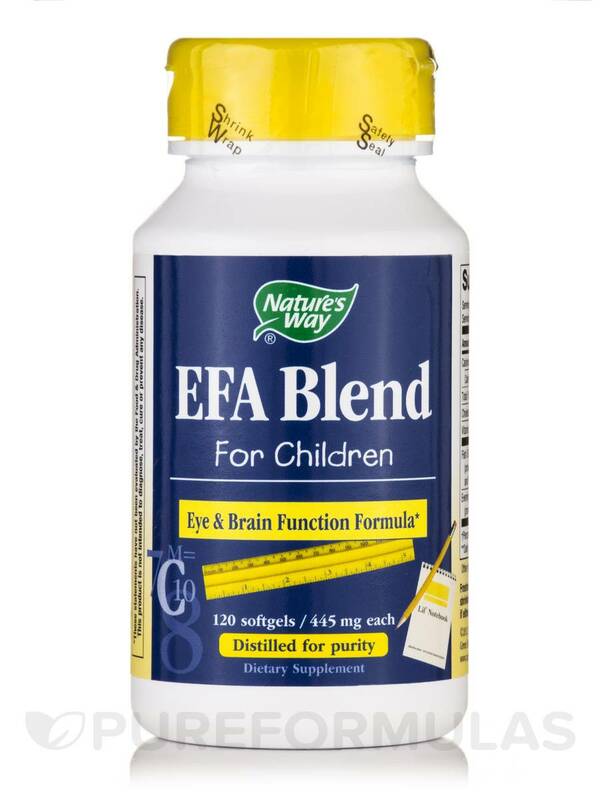 EFA Blend for Children 445 mg - 120 Softgels from Nature's Way® contain a combination of 30% Eicosapentaenoic acid (EPA)‚ 20% Docosahexaenoic acid (DHA)‚ 9% gamma-linolenic acid (GLA) and Vitamin E to help boost cognitive health and eye function. Studies reveal that these vital nutrients may be found naturally in nuts‚ seeds‚ meat and leafy green vegetables. However‚ children tend to consume an unbalanced diet‚ which could lead to deficiencies‚ and subsequent health conditions. 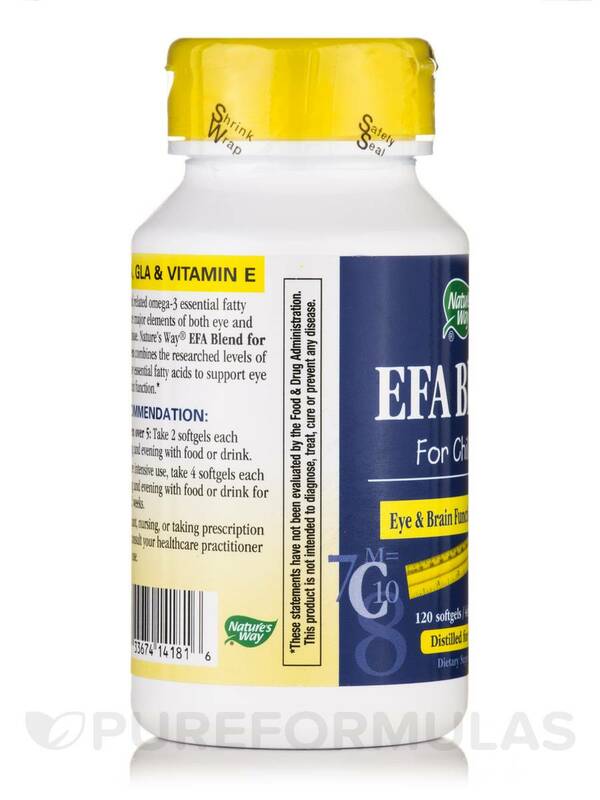 This dietary supplement from Nature's Way® contains a wholesome blend of vital nutrients that could promote brain and eye health in children. Scientists reveal that EPA may help slower the process of blood clotting‚ to help promote healthy blood flow to and from the health. This nutrient could possibly relieve inflammation in joints‚ and potentially aid in pain management. 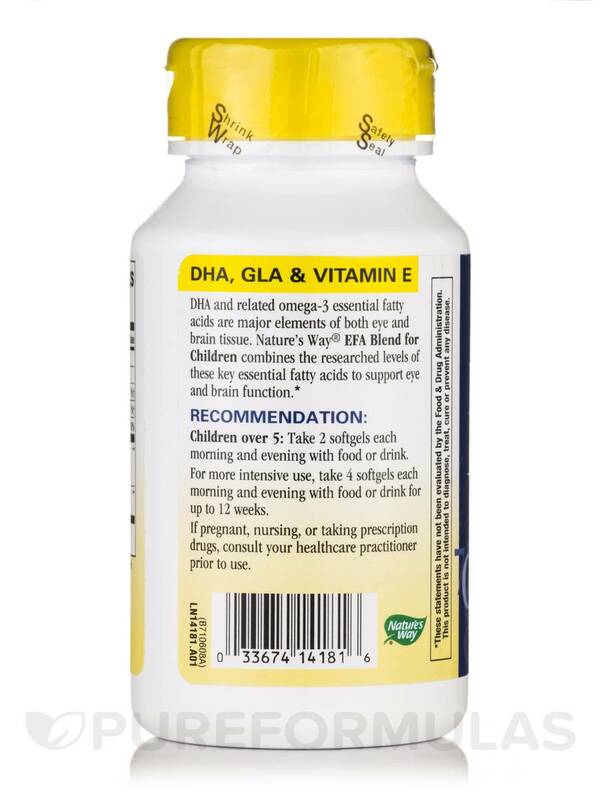 DHA could stimulate eye nerve and tissue development to help revitalize eye health. 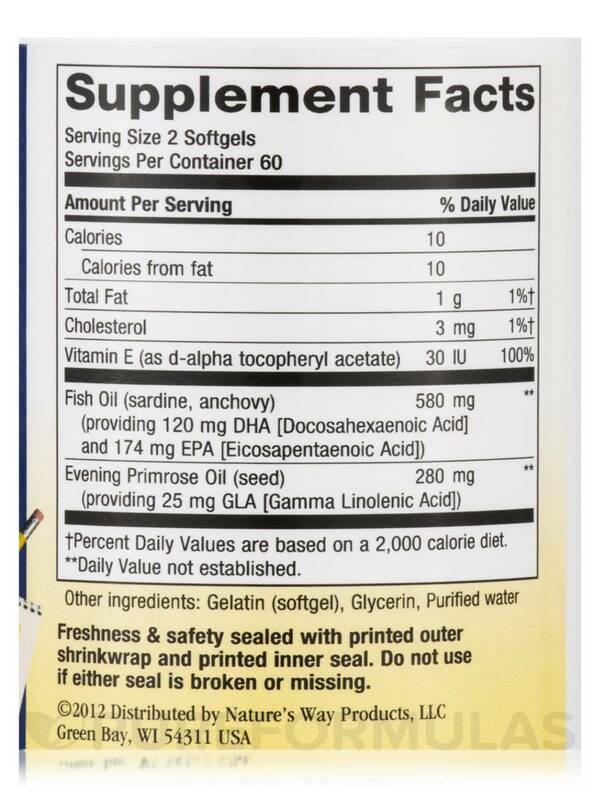 Reports indicate that GLA may improve nerve function and joint health. Vitamin E is known to act as an antioxidant to help enhance cell function and overall well-being. 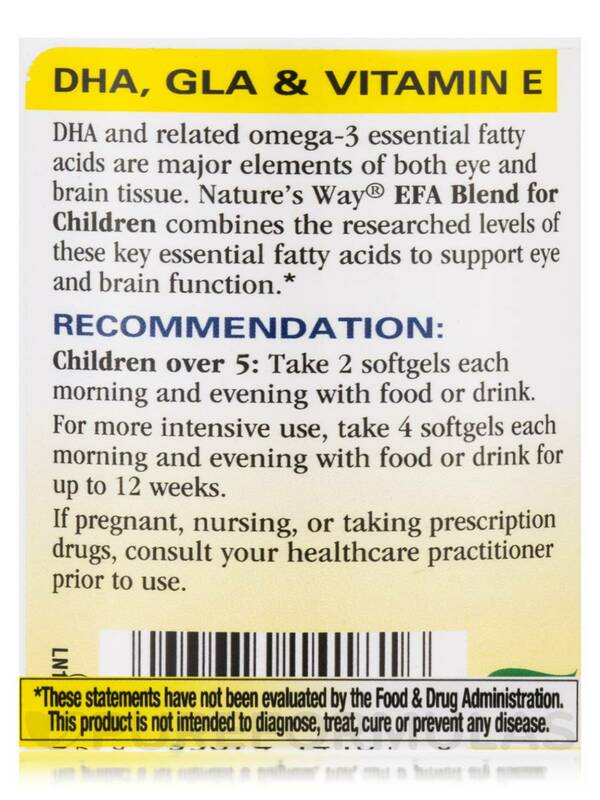 Get EFA Blend for Children 445 mg - 120 Softgels from Nature's Way® may enhance eye and brain health in children. 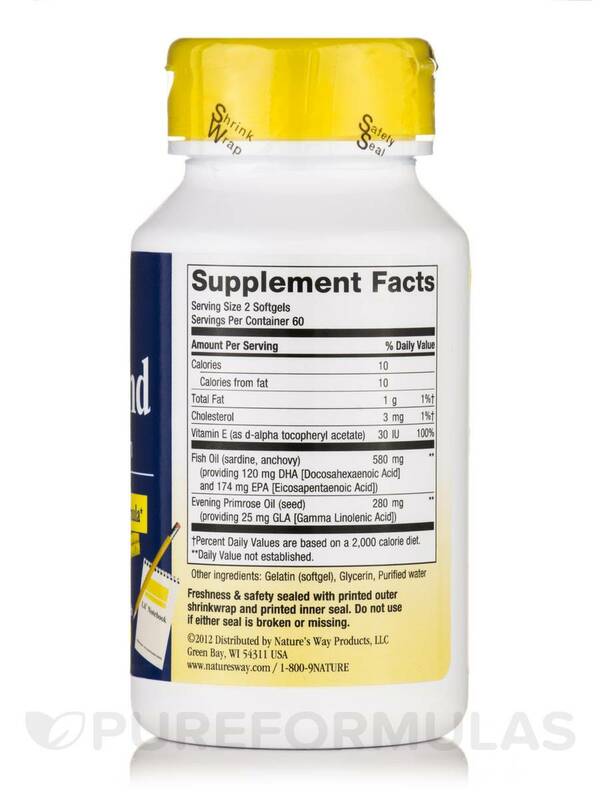 Adults and children over 5: Take two softgels each morning and evening with food or a drink. Children under 5: Take one softgel each morning and evening with food or a drink. These softgels can be cut open and the contents mixed with food or drink. For the first 12 weeks: Double the recommended daily intake. These levels reflect research findings. Pregnant and lactating women should consult a physician before taking this product.